Happy Monday! Our challenge this week at Simon Says Stamp and Show is 'just add pearl'. Don't miss the gorgeous DT projects, such a great variety. I cut the covers from mat board and inked them with Rusty Hinge and Vintage photo. A piece of manila cardstock was coloured with Antique Linen, Frayed Burlap and Peeled Paint Distress Stain, when it was dry I embossed it with a wood pattern stamp (one of my favourite stamps) and Vintage Photo Distress Embossing powder.﻿ The calendar was stamped on cream cardstock with Archival Jet Black and smeared with Antique Linen Distress Stickles for some shine. 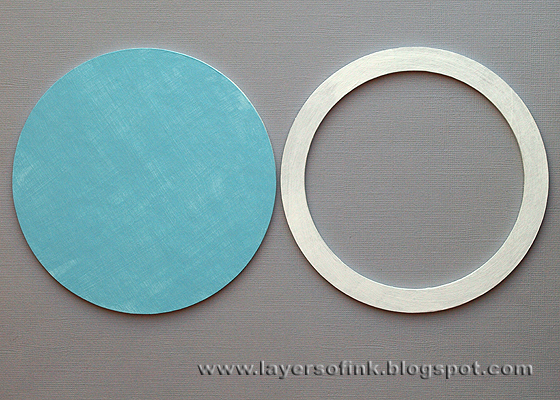 I cut the circle frame with Sizzix Circle Framelits, making it a bit off centre. It was inked with Rusty Hinge and I added pearls all around. 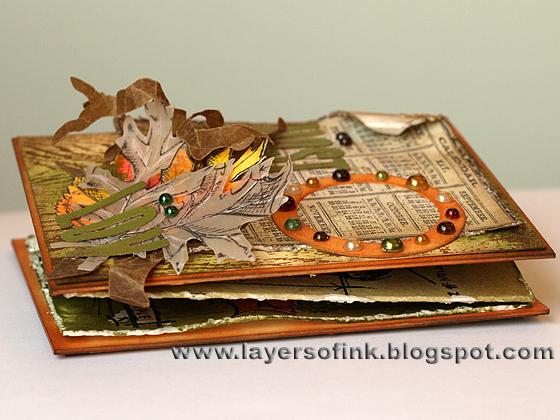 The title translates 'Autumn Leaves' and was die cut with the Inside Out die, from kraft core cardstock. I cut some branches from kraft glassine paper. 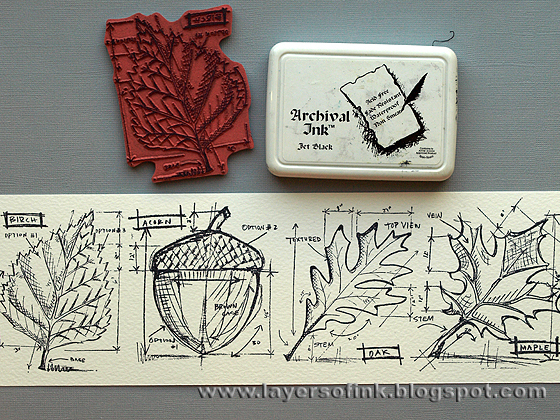 Stamped and coloured two Mini Blueprint leaves (I am using the larger version on the inside), and used the Mini Tattered Leaves to die cut two leaves from vellum and stamped them with Mini Blueprint leaves. First, I cut a long piece of watercolour paper and stamped the three leaves and the acorn on it with Archival Jet Black ink, spacing them out evenly. You have to use a waterproof ink for this step. 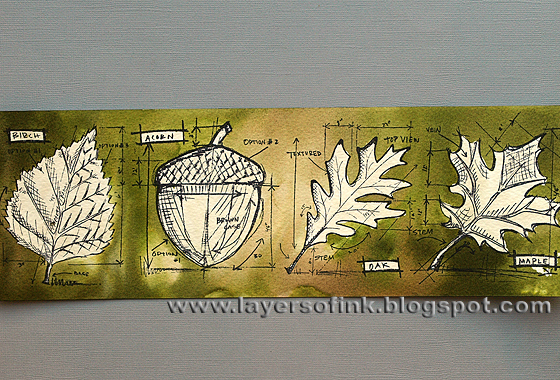 Let the Archival Ink dry for a while, then paint the leaves with art masking fluid. I was happy a few months ago when I discovered that the masking fluid didn't affect the Archival Ink, because this is a really easy way of masking. 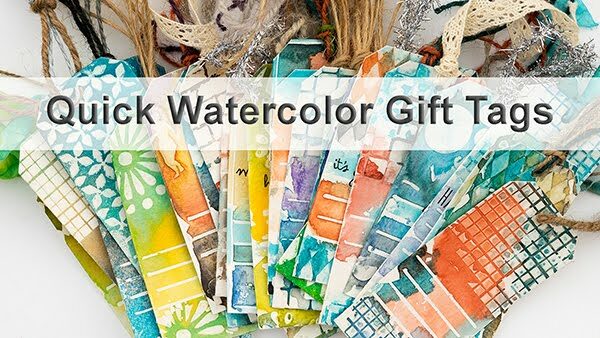 Use an old paint brush when painting with masking fluid, coat it with a little bit of soap first, and wash immediately when you are finished. Let the masking fluid dry. I wanted a fluid watercolour background and pounced Distress Stains (Antique Linen, Frayed Burlap, Peeled Paint and Forest Moss) on my craft sheet. Then I misted the paper pretty heavily with water and dragged and dipped it into the ink. ﻿This is the result. 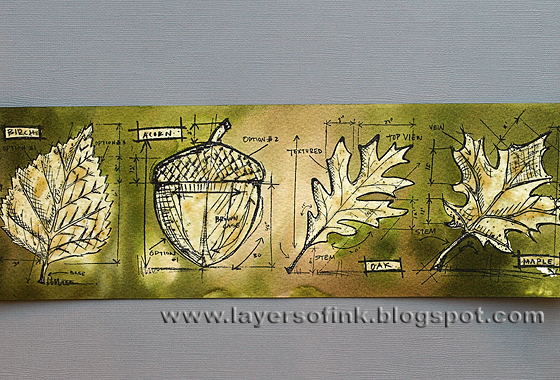 The masking fluid has protected the leaves from the ink. 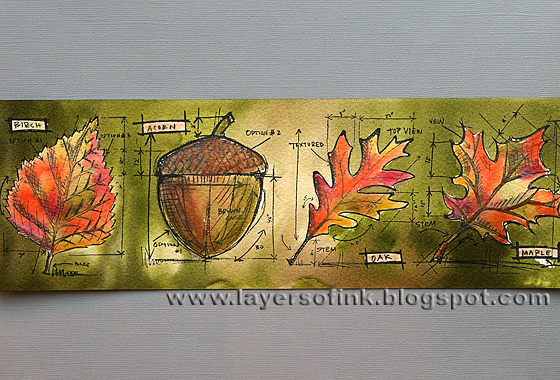 The shiny leaves and acorn look nice on the matte watercolour background, you see the shine better on this photo. ﻿Measure and score the accordion folds, then glue to the covers. 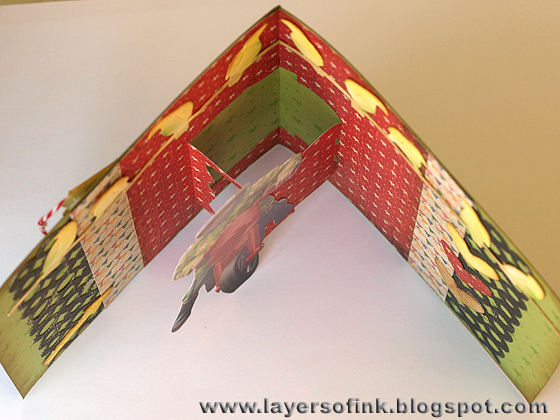 This is what the accordion booklet looks like folded up. Show us your pearly projects this week and you could be the lucky one who wins a $50 gift voucher from Simon Says Stamp. Thank you for visiting! Enjoy your week! 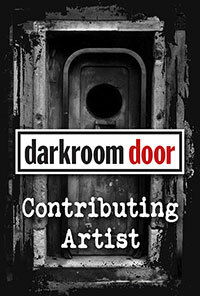 This week's case file at CSI:Color, Stories, Inspiration is so stunning, and don't miss the fabulous DT layouts. 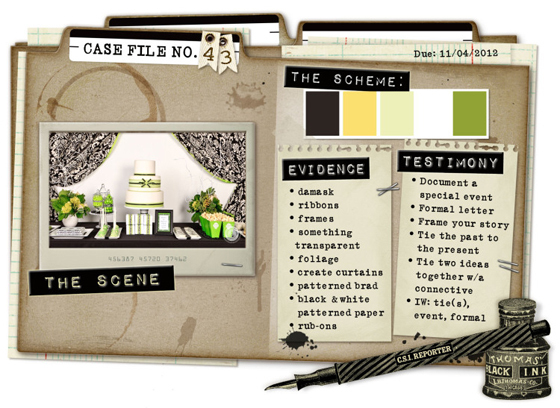 From the evidence items I used: foliage, damask, ribbon, something transparent, curtains and black and white patterned paper. I journaled about a special event: the renovation of my parents' house. I wrote a lot of journaling so I wrote it on a separate paper and placed it behind the layout. One of my favourite parts of the new look of the house is this city wall paper on two walls in the kitchen. I mimicked it on the background with a stamp. 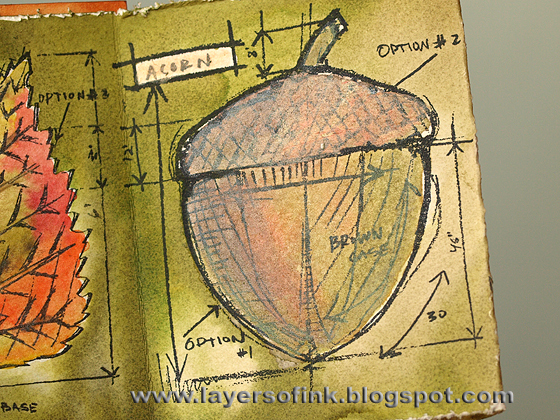 Because I used watercolour paper, and this stamp has many solid areas, the texture of the paper shows throw. It was stamped with Archival Jet Black ink. I used a foliage and bird stencil and misted Dylusions and home made mists through it, and I misted the yellow Dylusions mist here and there on the layout. Without planning it at all, one of the spots ended up looking like the sun coming up over the village. At the bottom of the page I misted yellow through a art definition text stencil, stamped with a brick stamp using Archival Ink Sap Green, and stamped with a splatter stamp with black ink. 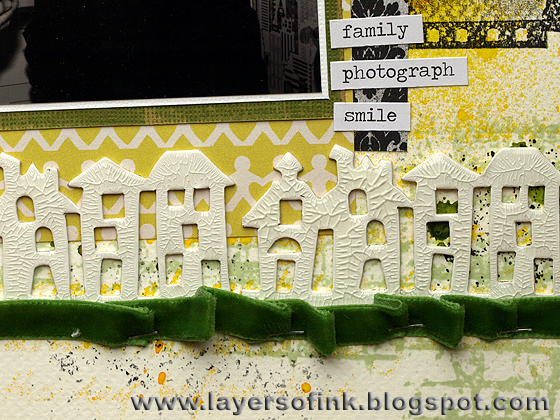 I also used the new Tim Holtz Sizzix Brick Wall Sizzlits die and cut it from white cardstock. 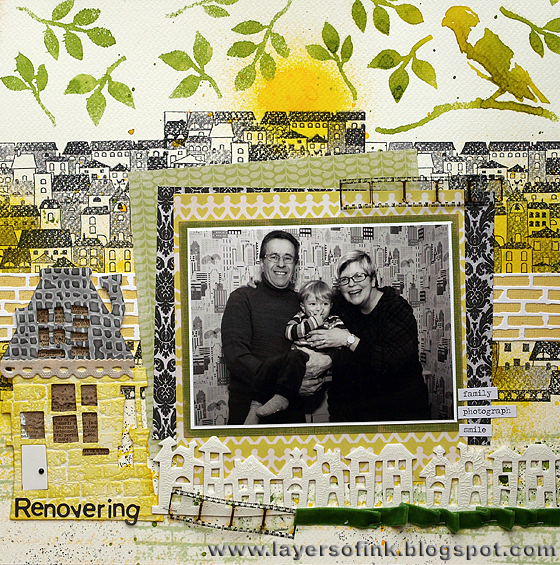 It was layered on yellow cardstock to look like the bricks of my parents' house. I splattered some of the green mist over the layout. Here's a close-up of the bird. 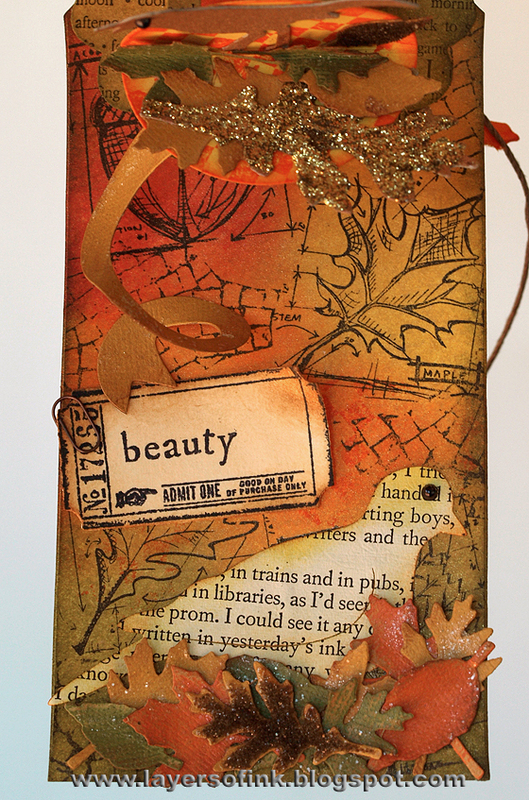 Love this Rickety House die by Tim Holtz and made a house based on my parents' house. It was die cut from white mat board, with the roof being cut twice. I embossed the house with a brick folder and inked it with Mustard Seed and Scattered Straw. The roof was embossed with a grid folder and inked black. I added a left-over vintage lace to the roof, it had been inked with Pewter Distress Stain. The house got mica windows, and lace curtains and I placed some text paper behind the windows. 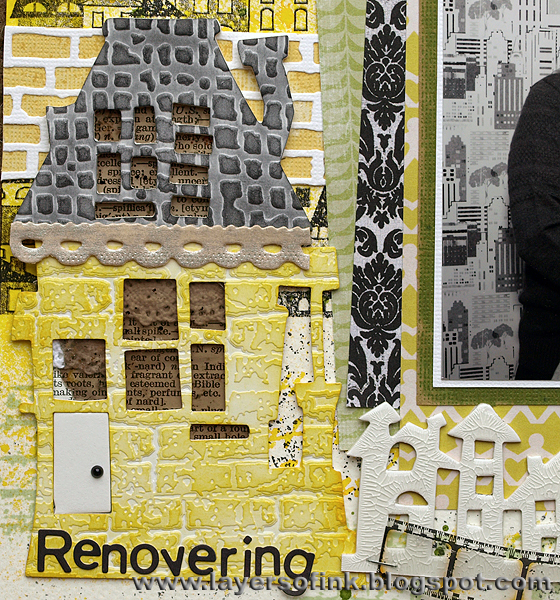 The Townscape was die cut twice from white mat board and covered with Crackle Accents. Thank you for looking!! Enjoy your weekend! 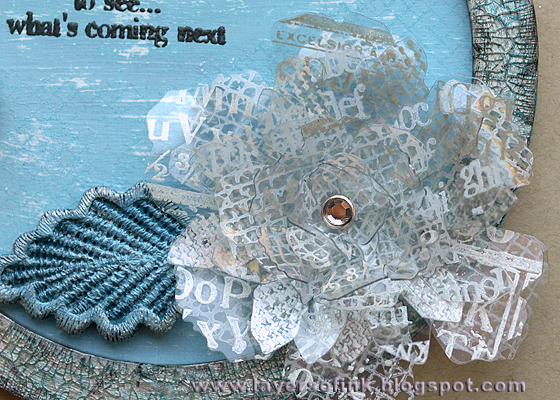 Stamps: Hero Arts: A Village S5432; Stamper's Anonymous Tim Holtz Ultimate Grunge. 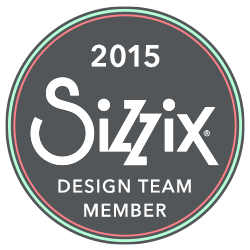 Today I am sharing a step-by-step tutorial on the Sizzix blog. It is a bit different from most of my projects, but once I got the idea, I just had to make it. I've had fun trying out different ways of using Eileen Hull's great Candy Drawer die, making it into a chest of drawers, a gift box and a shadow box. This time it became a kiddies Memory game. I used to love playing Memory as a child, and I made this for my son, who is still a bit too small to understand how it works, but still loves the cards. I used a lot of small dies for the images on the cards. It's a great gift project for a child and you can use images that interest them and make as many pairs of cards as you would like to. The box is fun to make too. 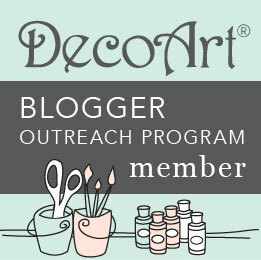 To see how I made this, head over to the Sizzix blog. Hi everyone! 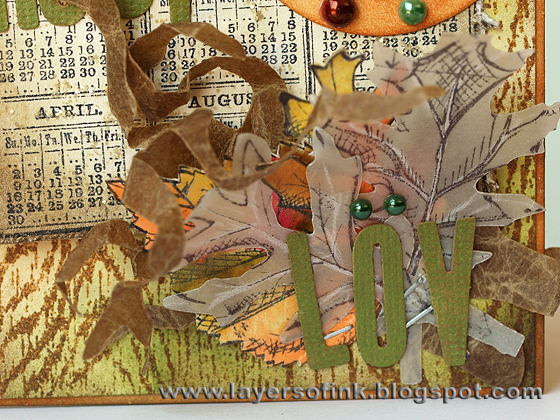 Today I have my version of Tim Holtz's 12 tags of 2012 October tag to share. 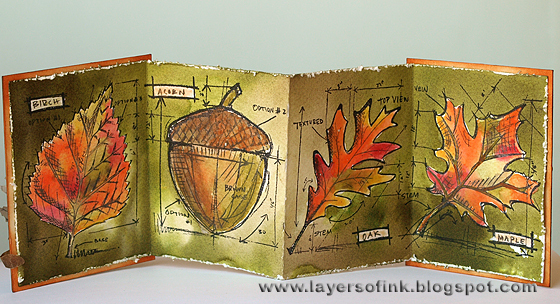 Since we don't celebrate Halloween, I made an autumn tag instead, and it has a fun brand new Karen Burniston Sizzix Circle & Ribbon 3D Platform pop up on the inside. It comes from her new Hearth & Home collection. 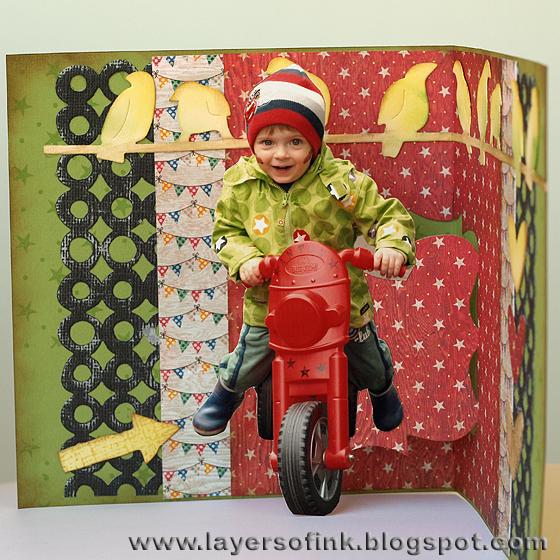 I also posted a pop-up card using some of the new dies here. I loved the technique Tim showed of colouring dry Rock Candy glitter with alcohol inks and used Pesto and Espresso to colour my glitter. I also used one of my favourite dies, the Branch Tree, which was die cut from grungeboard, painted green and then coated in glitter. The technique of colouring tissue paper with paint dabbers was also lots of fun. I used Sunshine Yellow, Sunset Orange and Jenni Bowlin red. 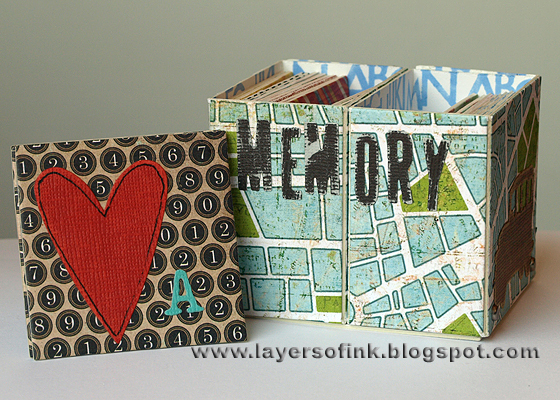 The background was stamped with Tim's new Stamper's Anonymous Mini Blueprint stamps. I misted it heavily with a homemade glimmer mist, I can't remember what I had made it with, a goldish yellow perfect pearls, mixed with orange (maybe Wild Honey distress reinker). You see the glitter and perfect pearls shine better on this photo. The ticket was die cut from manila cardstock and stamped. 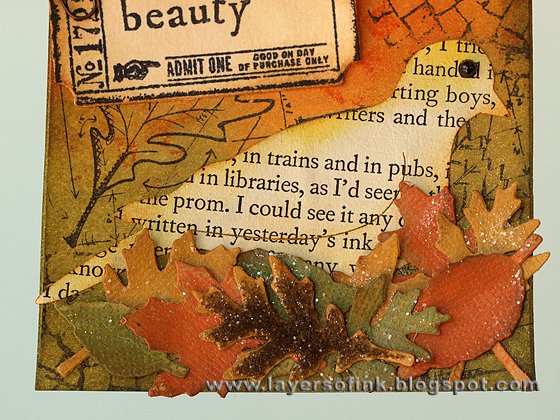 I also cut leaves from three different colours kraft core cardstock with the Autumn Gatherings die. They were sanded, inked a bit and then coated with Rock Candy Distress Stickles. And when you open the tag, you find this. Sorry very hard to photograph. The Circle & Ribbon pop-up die is so much fun! It consists of a platform, a circle on which you can place all kinds of things or maybe just stamp a sentiment, and such a fun spiral ribbon, which really adds a great element of surprise when you open the tag. I inked the inside with Distress Inks, stamped it using Archival Jet black, misted heavily and when dry added some more stamping. I inked the platform with Peeled Paint and stamped it with this great definition stamp from Hero Arts. 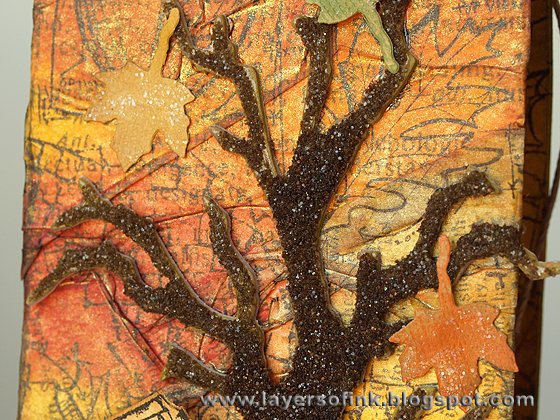 The circle was inked with Mustard Seed and Scattered Straw and stamped with Spiced Marmalade. The spirals were die cut from yellow kraft core cardstock, and coated with Rock Candy Distress Stickles. 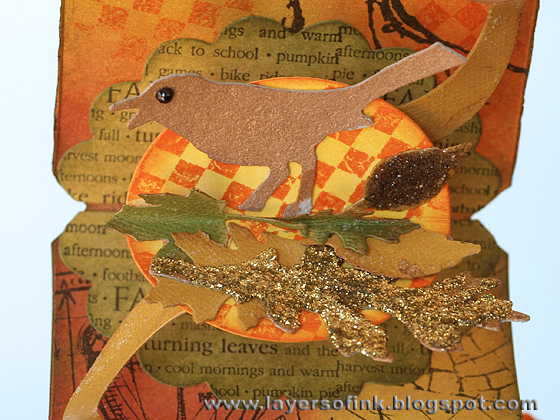 The bird was cut from grungepaper, using the Bird Branch die and coloured with Distress Stain Antique Bronze. I added some left over leaves around the feet of the bird, as well as a leaf covered with left over brown glitter, and a leaf coated with dry gold Stickles glitter. Here's another view of the platform and the leaves. A close up of the bird and the leaves. Hi everyone! 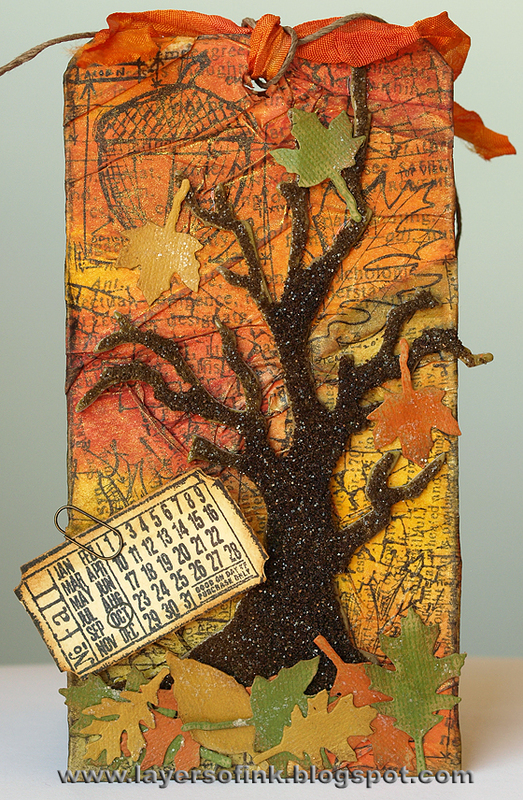 This week we have a special guest at Simon Says Stamp and Show, the fabulous Wendy Vecchi. During the week she will post two tutorials. 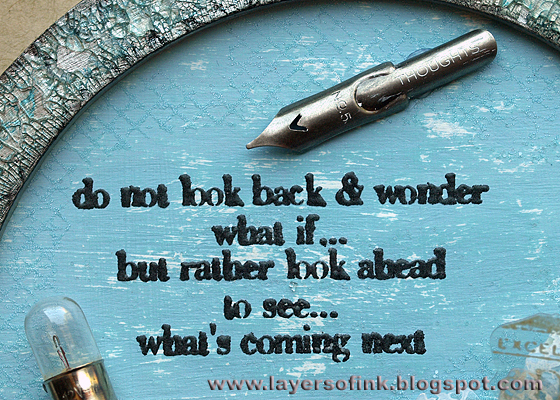 Looking forward to that! 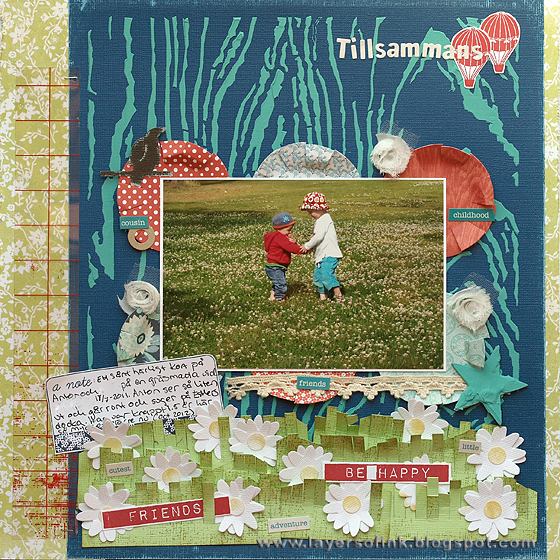 This week we are having an inspired by Wendy Vecchi challenge (you can see all her great Studio 490 products here). I hope you will play along with us! I used Wendy's fun Art Parts Large Circle Frame as the base for my frame, love how sturdy the art parts are. I painted the circle cream and when dry with Jenni Bowlin Speckled Egg and Soap Powder paint. After it dried, I sanded it to reveal some of the cream paint and give it a worn look. I painted the frame cream too, but later changed my mind and painted it silver instead. The great sentiment from Wendy's Celestial Art set was stamped with Versafine Onyx Black and clear embossed. I masked it with a piece of paper and stamped the surrounding areas with the large stamp from the same set using Versamark, and embossed with Ranger's Frosted Crystals Antiquities. Loved the effect, it was hard to photograph though. I layered all the flowers together and attached a jewel brad in the centre. The flower got a lovely Blossom Bucket Lace Leaf which was painted, first with Stream, and then dry-brushed with Speckled Egg. When dry, I coated it in a thin layer of Distress Stickles Rock Candy. After painting the frame silver, I sanded it and inked with Black Soot. Then it was covered with Rock Candy Distress Crackle paint. When the paint had dried, I pounced it with Tumbled Glass Distress Stain. I love the effect that gives. I hope you will join us in the fun this week! 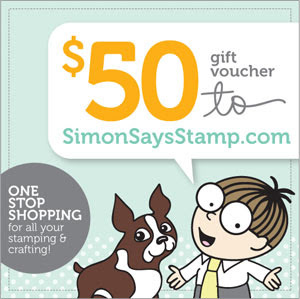 Just like every week, our generous sponsor, Simon Says Stamp, gives a $50 gift voucher to one lucky participant. Today I have a scenic card to share, my second card for this month's Craft a Scene challenge, 'Majestic Mountains'. I hope you'll play along with us, there is still a lot of time. This is a half-sheet scene (5.5 x 8.5 in), done on glossy cardstock and coloured with dye inks using a Colorbox Stylus tool (see this tutorial). 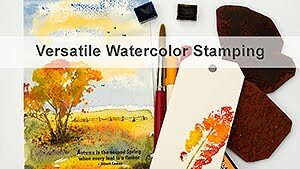 Kevin Nakagawa from Stampscapes has recently done fabulous videos explaining the basics of scenic stamping, don't miss them. I planned the placement of all the stamps on scrap paper first, as I usually do.The little cabin was stamped first, and then masked, something I don't often do, but I wanted the trees to come up behind the cabin, so it was necessary here. I wanted to use this mountain stamp from Sutter stamps and stamped it twice to fill the width of the paper. I added some extra trees at the base of the mountains, apart from those already included in the mountain stamp. Before stamping the addional pine trees, I wiped the bottom of the trunk a little bit, so that they look more natural growing out of the grass. 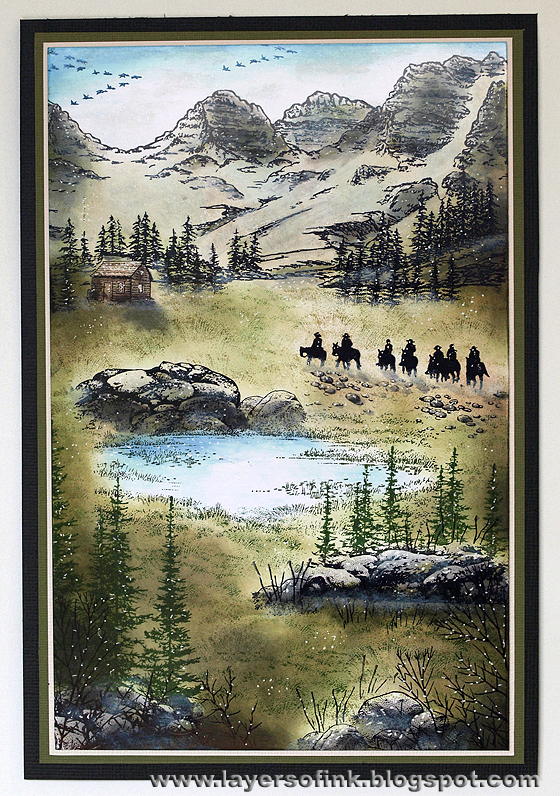 The little pond was stamped and then I added some boulders behind it, and some pebbles around the path of the riders. The trees in the foreground was stamped with Archival Ink Olive, which I also used for the grass stamping (with one of my most used stamped, the Sedge Filler). The rest of the stamping was done with Archival Jet Black. I wanted to get natural looking and muted colours on the scene, and started as usual with the lightest shades, gradually building up more colour. I added quite a bit of brown to the grass. The mountains were coloured with brown, grey and a bit of green, and I added extra texture to the open ares on the mountains. I also added shadows to the house and the riders, using a darker shade of ink than the grass. The birds were stamped with Denim ink and partly placed where they are to cover up a smudge. Some foreground branches were stamped. Then I added mist by dry-brushing white pigment ink on the scene, such as on the mountain furthest away (the mist helps to push the mountain back, making it look further away). Highlights were added with a white gel pen. 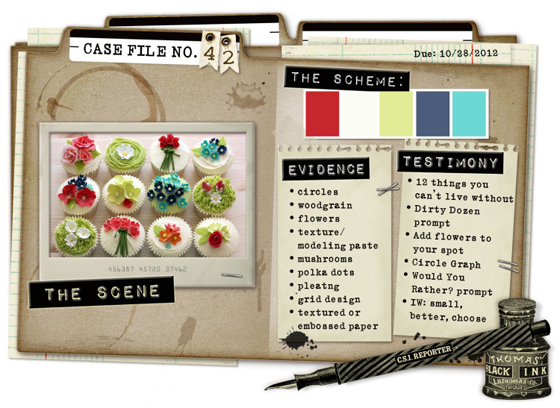 From the evidence items I used: woodgrain background, texture paste, polka dots, grid design, grass, flowers, circles. From the testimony items, I added a flower to my journaling spot and was inspired by the word 'small'. I just love this photo of my son and his cousin in a field of grass and flowers. I mixed modeling paste with acrylic paint and applied it through a stencil for the woodgrain background. I had a bit of leftover paste and smeared it on top of a die cut grungeboard star. The blue cardstock is Core'dinations so I sanded the edges a bit. Then it was mounted on a really old BasigGrey patterned paper. 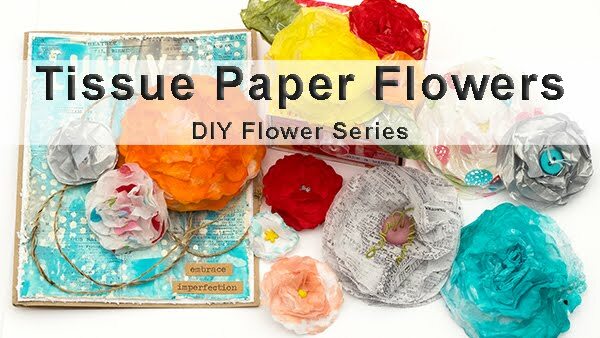 The photo was placed on top of six circles, but instead of using ordinary circles, I die cut them with a large fringed flower die, using six different 6x6 patterned papers (so the patterns are smaller). Here's a close-up of the woodgrain. 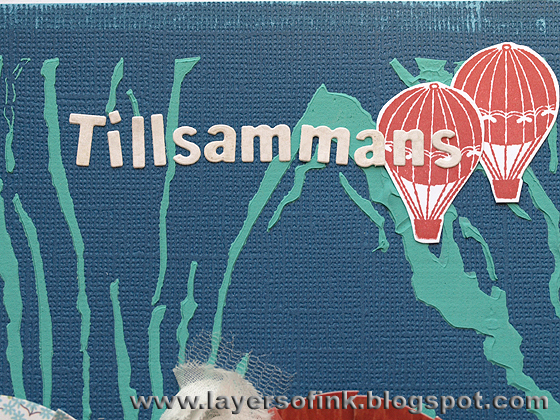 The balloons were stamped with Archival Ink Vermillion. The title translates 'together'. I had a little bird from the Birds on a Wire die on my desk and it really wanted to jump onto the layout. Love these birds. The grass was made with Eileen Hull's 3D Flowers #2 die. 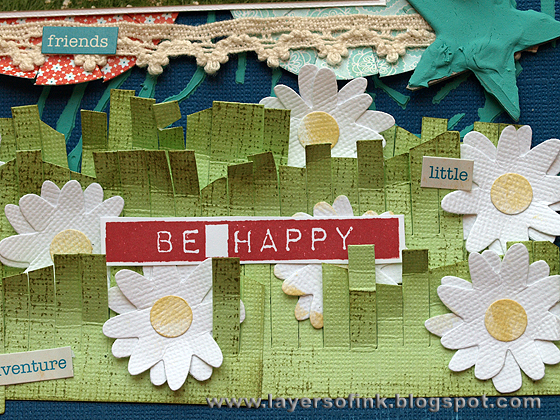 I cut six strips from cardstock and cut many of the fringes to make it look more like grass. They were stamped with an envelope background stamp. The flowers come from Karen Burniston's Hello set and were cut from white cardstock. The little circle was inked with Scattered Straw. Time to start with some Christmas cards! I send different cards to everyone at Christmas, never having been very good at making many of the same. 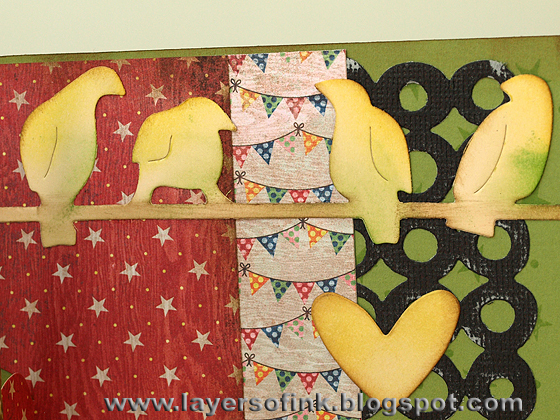 I used dies from the brand new Karen Burniston's Sizzix Hearth & Home collection on this card. You can see the whole Hearth & Home collection here, it is fabulous, so versatile, and certainly not only for Christmas projects. This card is different from my normal projects, I rarely do clean and simple cards. 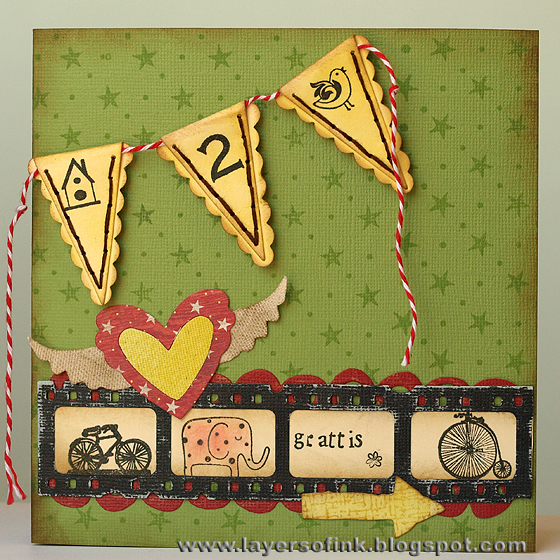 I made it for two Stamptoberfest challenges at the Stamping Board on Two Peas, the 'Good Things - Small Packages' (to use a small stamp as your focal point), and the 'Get a move on it' challenges. 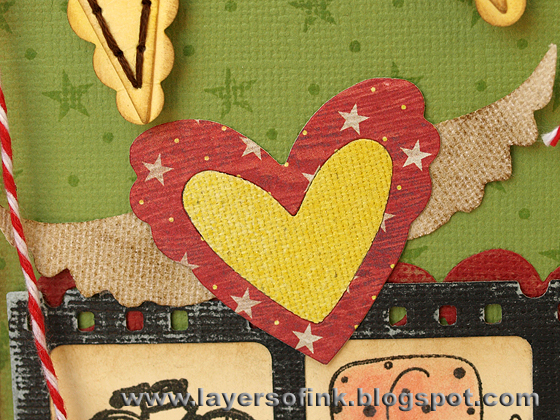 It is also for the Hero Arts October challenge, Holiday Cardmaking. 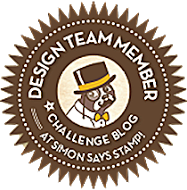 I totally forgot to write about Stamptoberfest here, it is an event organised by the members of the Stamping Board themselves. I host a challenge too, called 'Let it Snow', you can find the details here. I decided to do a card using only white cardstock, texture and just a little bit of colour. Sorry, the colours are a bit off in the photo, I didn't have great light for an all white card when I took it. I used the great Bracket Frame & Label Bigz die on the front and cut it from Specialty Stamping cardstock. This is such a great die, you get the centre label and the two frames, all of which work well both together and on their own. I decided to use all three here. The two frames were embossed with a heart and a dot folder and the smaller frame was mounted with foam dots. I love the feel of Specialty Stamping paper. I also die cut three little snowflakes, using the Snowflakes Framelits set. The bird was stamped with Archival Jet Black ink and coloured with Distress Ink (Barn Door and Tumbled Glass) and a craft nib. 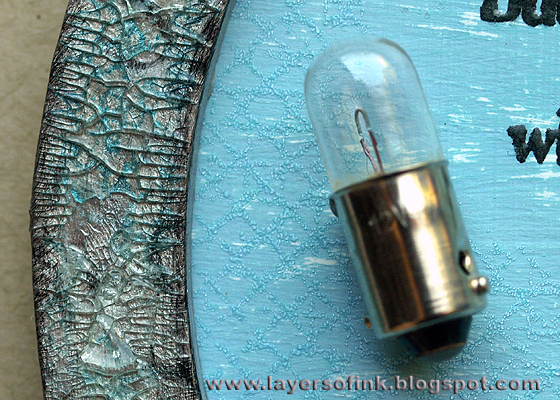 Here's a close-up of the dry embossed texture. I continued the white theme on the inside, and used the fabulous Raising 3D Platform die. Such a fun die! When you open the card it literary raises up to meet you. Perfect for sentiments, but for tons of other things too. 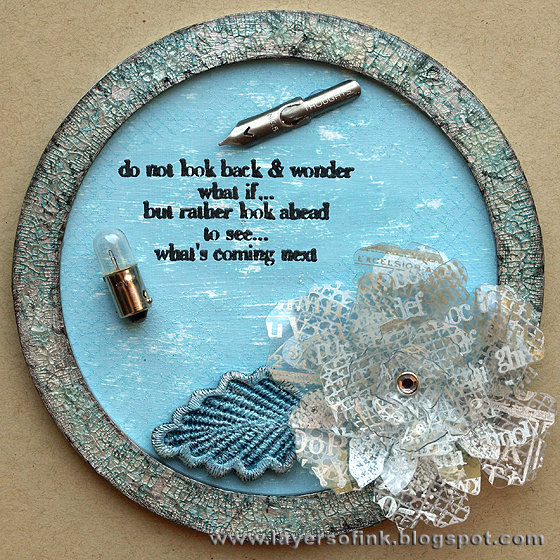 Here I used it for the sentiment, and stamped the sentiment inside the Fancy Frame Bigz die. The two fancy dies fit perfectly on top of the platform. The insert in the Raising 3D Platform die explains how to fold and assemble die pop-up, it is much easier than what it looks. Here's a close-up of the platform. I used the inner oval from the Fancy Frame to stamp another bird. 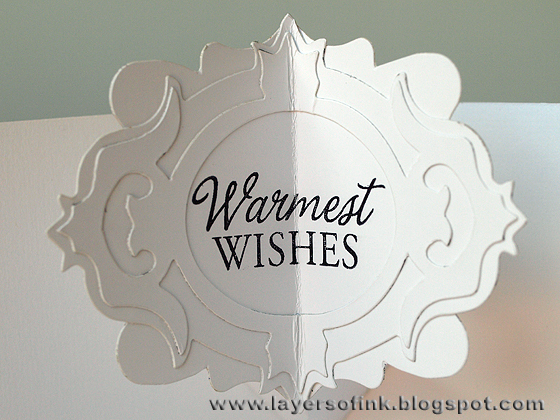 I also added a strip of Specialty Stamping paper, which was embossed in a winter word folder. Here's a view from another angle of the pop-up. Hi everyone! 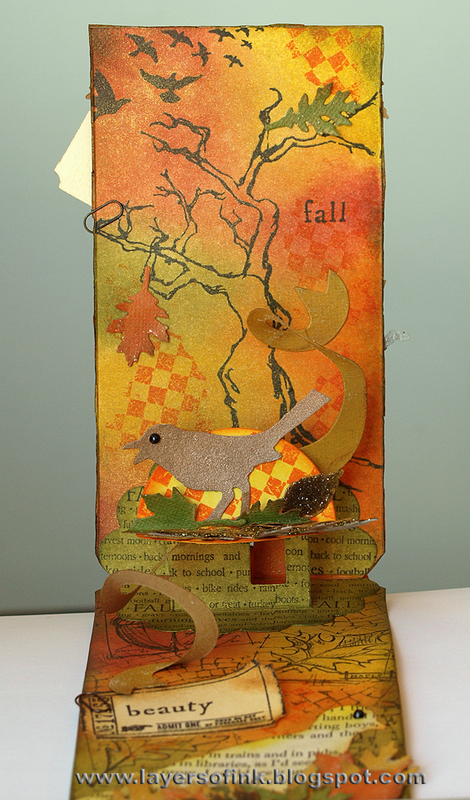 I have another pop-up card to share today, using Karen Burniston's Sizzix pop 'n cuts dies, and some other dies too. My niece and nephew have their birthdays very close together, he got the pop-up card you can find in this post, and she got the card below. Here's the front of the card, kept pretty simple. 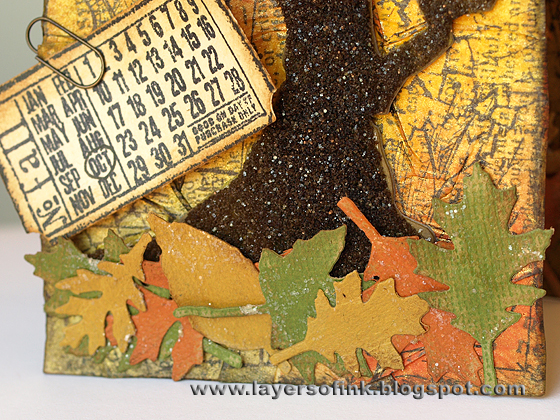 The cardstock was stamped with a star background stamp, for a tone-on-tone effect. 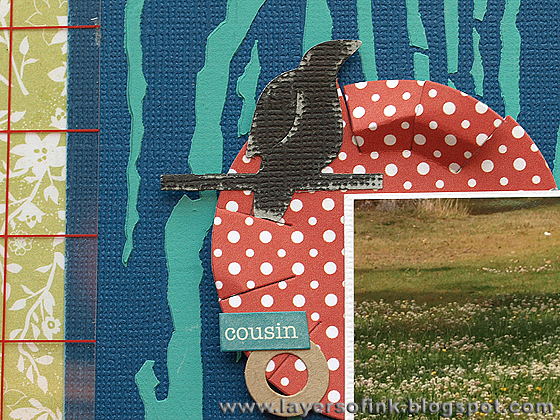 I die cut a film strip from Core'dinations cardstock, sanded it and backed it with cream cardstock, a perfect place for small stamped images. 'Grattis' means 'congratulations'. 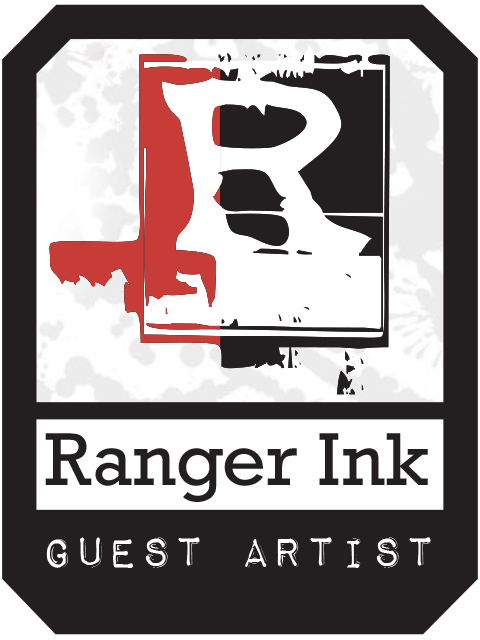 The arrow was die cut, inked and stamped with an envelope pattern stamp. I placed Washer Border strip behind the film strip. This Heart & Wing die is so sweet. I cut the wings and the small heart from sticky back canvas and inked with brown and yellow distress inks. The larger heart was cut from patterned paper. 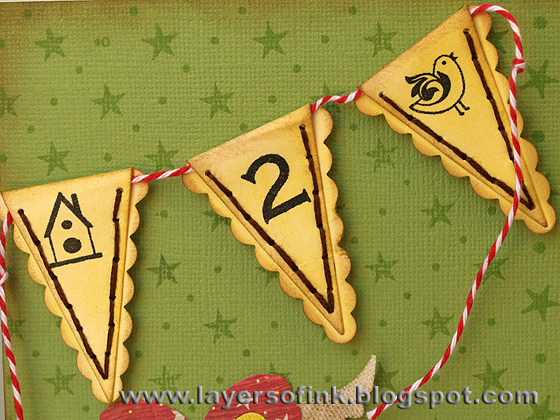 ﻿This fun banner comes from Eileen Hull's Cupcake Stand & Pennant die. I cut it from manila cardstock, inked yellow, folded over a piece of twine, added some stamps and a stitched border. It was adhered with foam tape. Here's the inside of the card. 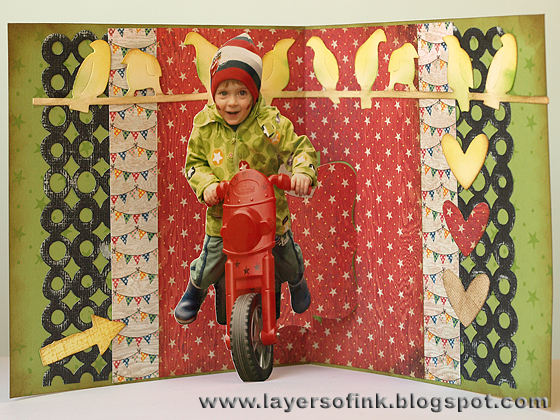 It is lots of fun to place photo cut outs on pop-ups, especially for kiddies cards, since when you open it, it looks like he is just jumping out on his bike. I used the versatile Label pop-up die here. I repeated the star stamping from the outside, as well as the star paper, the yellow arrow, and the washer border (cut in black Core'dinations cardstock and sanded). The three little hearts come from the Heart & Wing die. 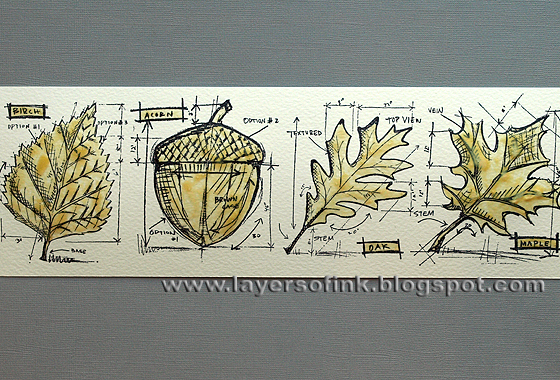 Two were cut from canvas and the third from patterned paper. 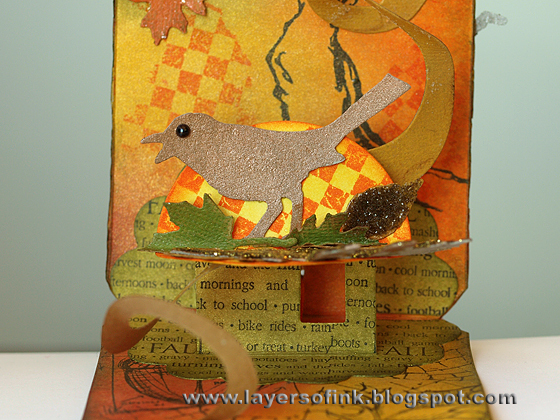 I just had to use of my favourite dies, the Birds on a Wire. 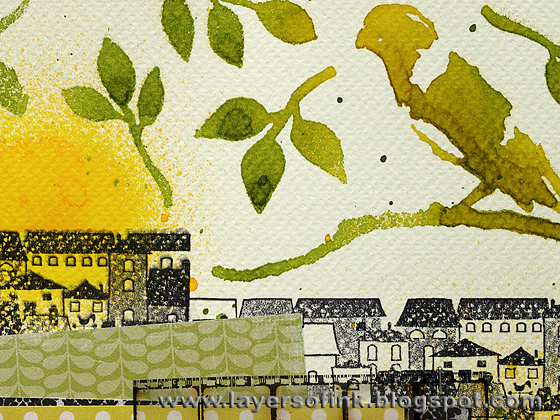 I cut it from manila cardstock and inked it softly with yellow, green and brown inks. Another angle of the pop-up. Here you can see the pop-up mechanism from the top. It is very easy to assemble since the die both cuts and scores the pop-up.